Yes, what began as an April Fools’ joke 10 years ago is now a fully-fledged part of Warcraft lore. Freaking pandas. Okay, maybe it’s not so bad. 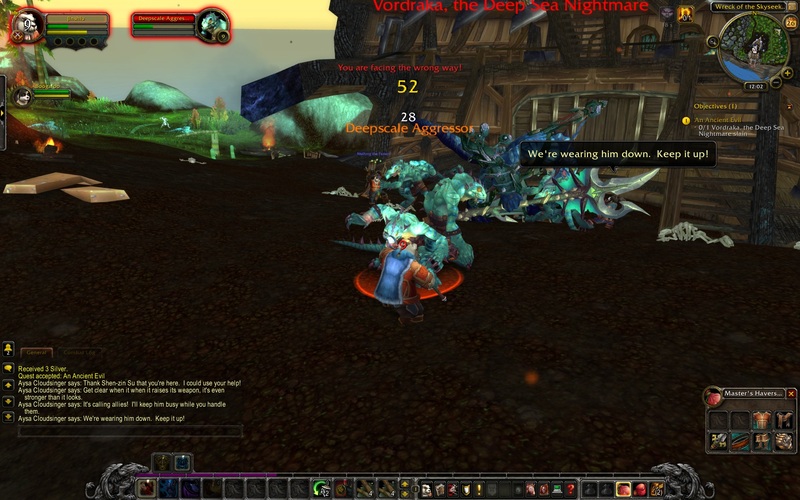 Let’s sit down and DO this; come on Blizzard, wow me. Opening cinematic is missing Jack Black’s voice talent but is otherwise a good trailer for the next Kung-Fu Panda movie. Blizzard cinematics are unparalleled for production value in my opinion, and this one is no different, but it does take a somewhat silly comedic slant for no apparent reason. I guess it’s now time to create my very own pand… what the hell is this? Are these… are these graphics? Good grief this is an ugly game. I can deal with this. I can. Breathe in. Breathe out. I am centred. Zen, or Feng Shui, or something. 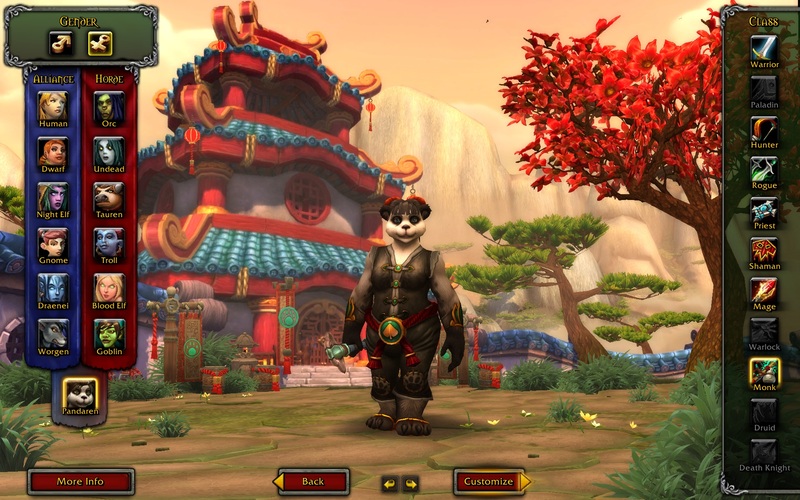 Alright, it’s time to get in to the game proper and check out what this Monk class and Panda starting zone are all about. …Uninspired skills and Kill-X quests apparently. Seriously, every quest hub area seems to host two NPCs: one who wants me to go make a few things not live any more, and the other who wants me to gather things, usually from other things I’m making not live any more. I complete these, and get shuffled to the next duo of NPCs to do the same tasks with different items. I’ve noticed that each new quest dialogue box that pops up on screen is accompanied by a sigh. Not from the game audio, but instead irrepressibly from my own lips. This game is draining. I’ve spent a lot of time complaining that MMOs as a genre aren’t advancing, and all it takes to see how far they’ve come – even if it’s only been in the last year or so – is to go back to WOW. 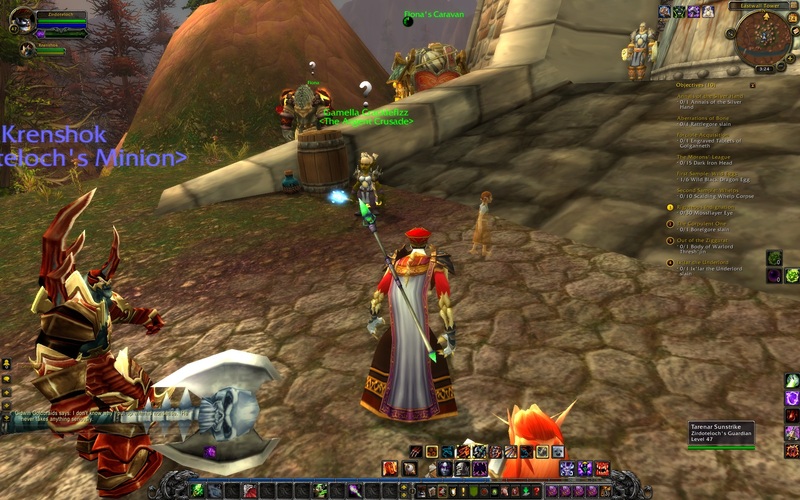 It’s an antiquated MMO, and that’s exactly how it plays. I push myself through to the completion of the starting zone, where as an impartial representative of Pandaria, I have the choice of siding with the Horde, or Alliance, at my discretion. I choose Horde, and within an instant I’m staring at the familiar surrounds of Orgrimmar. This again? Already? I feel like I could navigate the place blind, or draw it pixel for pixel relying on nothing but my mind’s eye. It seems, right at this point as the memories begin crashing down upon me, that the entire game has existed and is played out within this city. I’ve had enough. On a technical level there’s probably not a lot one can really complain about. Everything developed with the usual Blizzard aplomb; or at least, the aplomb it had prior to Diablo III. The graphical style of course is continued with a distinct flavour of five-spice, but it’s… I need more. Maybe the story gets good for my little panda. Perhaps his choice of tank-style class alignment will come into its own and be a great thing to play. The truth is I’ll never know because I’m now looking at my desktop as I consider my experience. The truth is that it’s been a great year for MMOs. SWTOR’s wonderful storylines, TSW’s left-of-field quest design and character development, GW2’s approach to rewarding players for everything they do. Given the first game’s move to free-to-play, the second’s unparalleled brilliance, and the third’s polish and lack of subscription fee, I’m left to wonder at the place WOW now holds in the industry. Clearly it still owns the market; that cannot be disputed. But it feels out of touch, no longer relevant. I can barely muster the energy to load the game again. I should play it more, try to be fair, to capture that ever illusive “objectivity.” But I don’t want to. When I finally do, it’s to play a different character. I can’t look at those starting zones, those early level areas anymore, because I’ve played them too many times. Strangely enough, and though it takes some time, I begin to remember the attraction. I’m listening to three disparate NPCs tell ever-taller tales about how each personally scared away Deathwing, and I’m smiling. The trouble is that part of me remembers and mourns the loss of the more serious side of the lore. 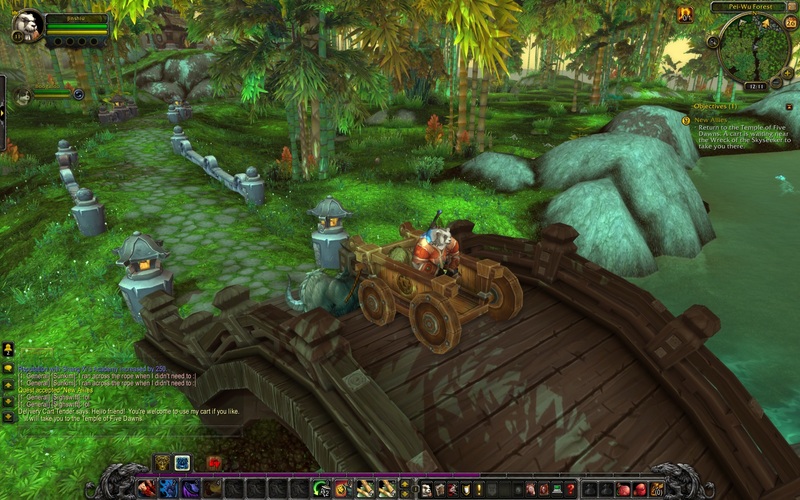 I remember when Warcraft was Orcs and Humans, when humour was an easter-egg, not the driving theme. What was once a sombre universe, exploding from nothingness into the beginnings of the RTS genre, bearing a respectable (though arguably pilfered) lore, has developed into a parallel parody and is now little more than comic relief. Still, I’m not absolutely hating the experience now that I’ve changed tack, but it does seem that every concession I’m granting the game is balanced or outweighed by outmoded ideals. For every enjoyable quest there are eight that are complete rubbish. For each battle that tests my skill, there are no free bag slots and long flights back to a bank. And did I mention how hideous the game is? 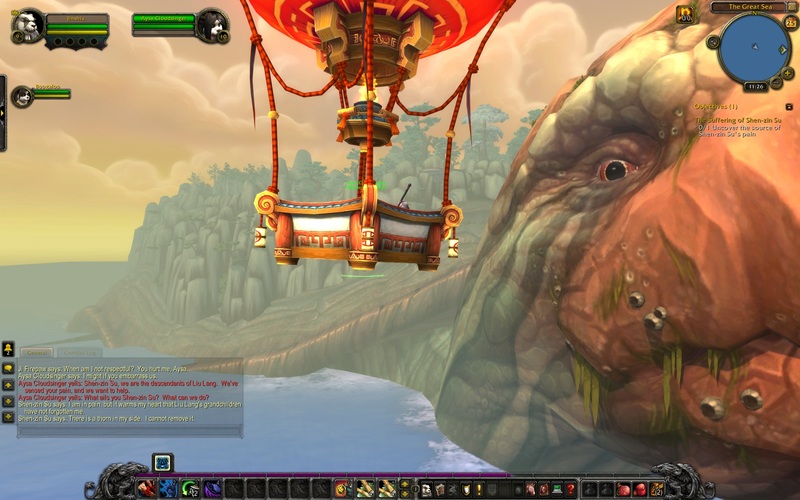 As I reconsider my position, the only conclusion I can reach is that Pandaria, and indeed World of Warcraft in general, is a game for the fans, those who believe heart and soul that Blizzard can do no wrong. For the rest of us $15 a month is just too much money to pay to play a game whose mechanics are now a relic of a bygone era. ~ by accurateobservation on November 1, 2012. Definitive Proof: Games As Art.